I asked my Facebook likers and Instagram followers if they'd like a What I Got For Christmas post and, surprisingly, quite a few people said yes so here we are! I am very thankful and grateful for all the gifts I received during this holiday season. Please don't see this as bragging, I just wanted to share it with you all! My Mum gave me this candle, as well as a MYER Gift Card. This candle was purchased to sit on my dressing table and it's perfect. It looks so great with my Queen Elizabeth/French Provincial style dressing table. This candle has no scent. My sister gifted me these cosmetic products. She knows I've wanted to try all these products for a long time now so picked them all up for me! 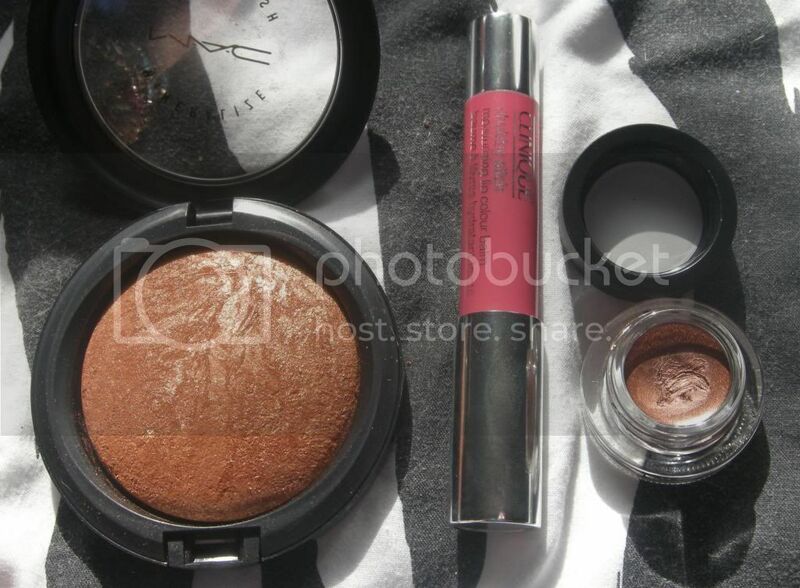 Left to Right: MAC Mineralized Skinfinish in Gold Deposit, Clinique Chubby Stick in Curvy Candy and MAC Fluidline in Rich Ground. 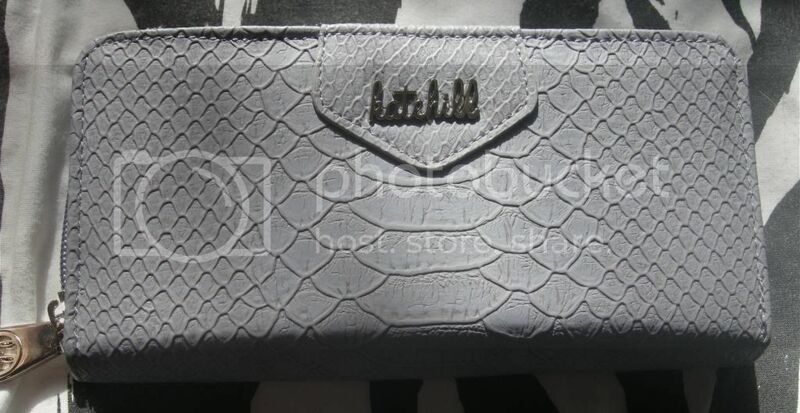 Along with the above cosmetics, my sisters bought me a beautiful Kate Hill wallet. Whilst I loved it, it was absolutely massive (struggle to fit in my handbag) so, with their blessing, I swapped it on Friday. 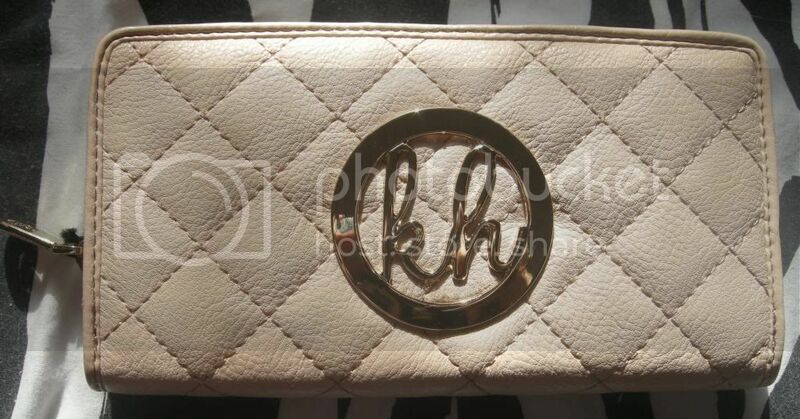 Given that Kate Hill was having a fantastic sale, I was able to pick up two wallets for the price of one. The first is the same design as the one chosen for me, only smaller, but I love both. My dear friend Amy (writer of Following the Reader and guest blogger here on Born to Buy) was true to herself and gave me a book for Christmas, as well as a Revlon Just Bitten Kissable Balm Stain in Sweetheart. 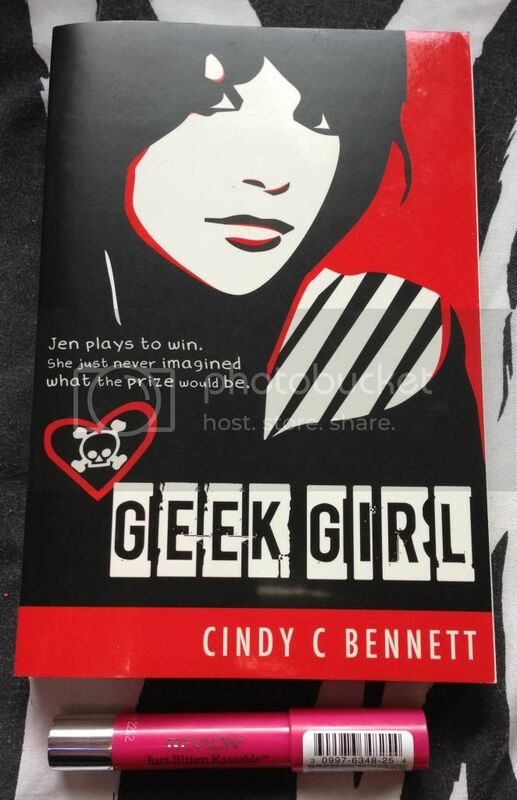 Amy and I have very similar taste in books so I'm really looking forward to reading it! Finally I've been gifted a fair bit of money for Christmas this year from a number of different people, namely my Dad and Grandparents. Above are some of the things I've purchased with this money. 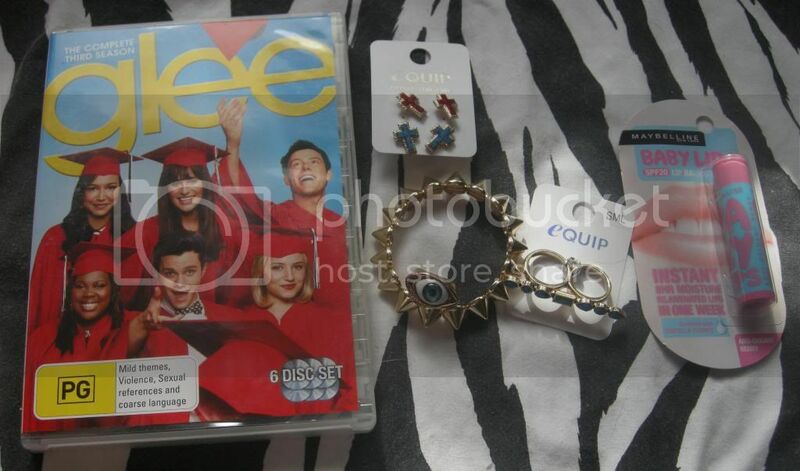 I collect tv on dvd and bought season 3 of Glee before I headed away - I needed something to pass the 6 hour drive! The jewellery without tags was purchased from Lovisa. 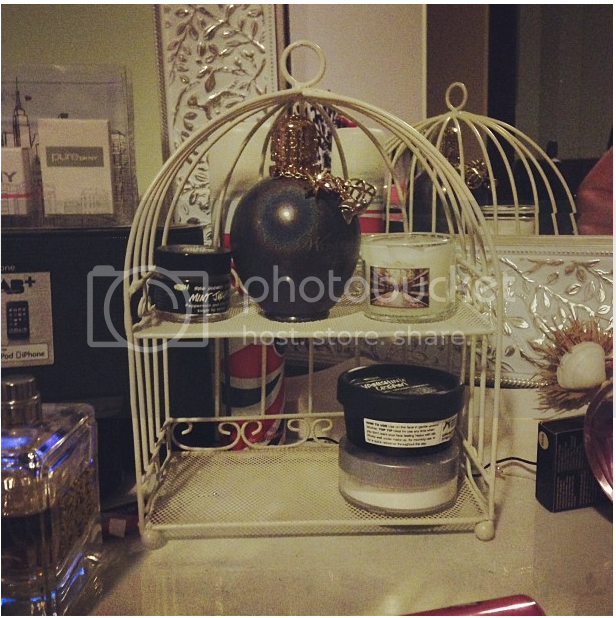 The bird cage shelf was bought from Typo and I absolutely LOVE it. I've also bought myself some clothes but they're in the wash. So, everyone, that's what I received from Christmas. I'm yet to spend my MYER gift card and I have some Christmas money left, so I think I'll be saving that for a MAC collection that really catches my eye. Good idea, don't you think? To see what I gave this Christmas, click here. Once again, I'm very thankful for everything I received this Christmas. I hope you all had a fantastic festive season. I'd love to hear about what you received this Christmas. Comment below! 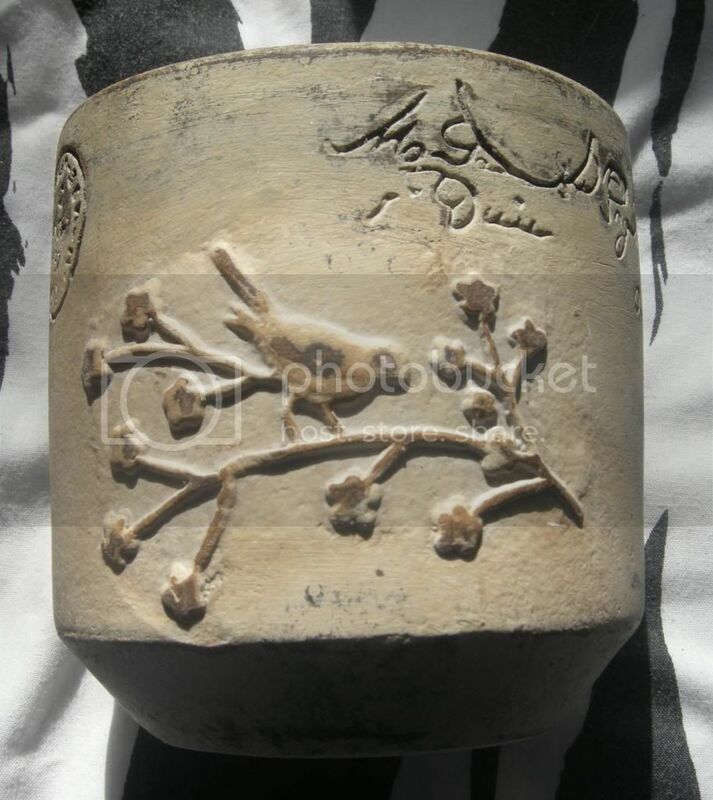 I love those MAC pieces! I want that shelf from Typo! I love the birdcage shelf too.